The Tailgate Party will be held Saturday, September 13, at Poplar Grove Winery from 6:30 – 9:00 pm. 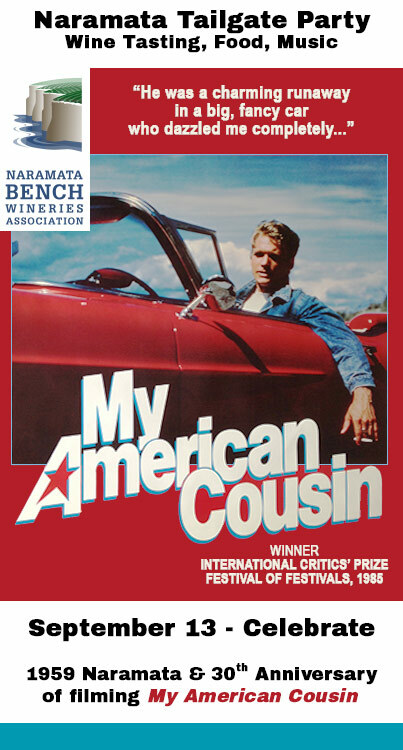 The Writer/Director of “My American Cousin” is Naramata born and raised Sandy Wilson, and she along with cast and crew members will join you and the wineries for an evening evoking Naramata in 1959. Once you get your tickets start looking for your 50s outfit as there will be prizes for the best costumes. There will also be distinctive wines from the Association’s 24 wineries, delicious cuisine from local restaurants, and music from the era to listen and dance to. Be sure to purchase your tickets here before they sell out! !